Almost everyone has heard the phrase “team culture” thrown around, but what does it actually mean? A team’s culture is made up of the behaviors, attitudes, values, and beliefs shared by a team. It’s the way people work together to achieve goals and how they connect with one another. Team cultures are typically unspoken and unwritten, which makes them difficult to describe and shape. In the workplace, trust and friendship are vital for a healthy team culture. If your employees struggle to get along, then the office will lack energy and enthusiasm. Employees that dislike their coworkers or don’t really know the people they work with are much more likely to be counting down the minutes until they get off. On the other hand, when camaraderie is established, employees come into work relaxed and willing to bounce ideas off one another. A sense of closeness among coworkers also lowers employee turnover rates. So, how can you cultivate trust and friendship among your employees? Take your team out to lunch, happy hour, or any other get-together where employees can connect outside the office. Allow conversations to happen throughout the workday (within reason). Set weekly team meetings to go over goals, plan projects, and discuss any issues or successes your team had throughout the week. In order for people to act like a team, they must have a purpose in working together. Team goals give your employees a unified vision for what they’re trying to accomplish. If you only dole out individual assignments and fail to incorporate an overall group goal, then your employees will feel more like lone wolves rather than a collaborative team. When creating team goals, gather your group together and listen to their input. Construct goals and objectives your employees can take on as their own. Give your employees the freedom to decide how to reach their goals. Putting responsibility in their hands adds value to what they achieve and increases the need for teamwork and collaboration. It’s also important that you set goals your team can accomplish. Unrealistic goals will negatively affect your team’s confidence. 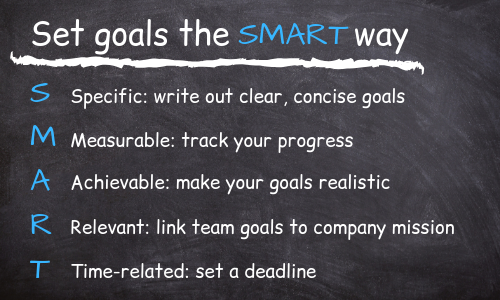 A simple way to make sure that goals are met is by using the acronym SMART: specific, measurable, achievable, relevant, and time-related. SMART goal planning provides clarity, direction, and a completion date. Favoritism is one of the quickest ways to disrupt team morale. When select employees are given special treatment or unfair advantages, the team becomes unbalanced. No one enjoys watching their coworker stroll into work late every day while the rest of the team is punctual, or seeing the best projects go to the same employees time and time again. Unfair preferential treatment can rouse jealousy and drama, creating a dysfunctional team. Be conscious of how you interact with every employee. Make sure everyone plays by the same rules. Give equal time and attention to all your staff members. Giving raises, projects, or other benefits to employees based on hard work and accomplishments will inspire others to follow in their footsteps. When your team hits their goals, passes a milestone, or completes a project, it’s time to celebrate. Noticing your team’s hard work and showing appreciation for them builds company morale and employee engagement. Celebrations can come in all shapes and sizes. For example, when a big project reaches its halfway mark, you can have pizza delivered for lunch and eat together in the break room. Then, when your team completes the project, you can give them a small bonus or go on a company outing. Celebrations allow your employees to feel proud about their hard work. Getting the team together to honor their successes inspires future growth by reminding them of what they’ve already accomplished. Managers make up a huge part of team culture. Scheduling weekly one-on-ones with your employees will make them feel like an integral part of the team’s overall vision. In fact, Gallup reports that employees who regularly meet with their managers are almost three times more likely to be engaged at work than those who don’t. Make time to have one-on-ones with each member of your team. Schedule the meetings on your calendar and confirm them with your employees. Hold the meetings in a private area, where your employees feel comfortable speaking freely. Plan the amount of time the meeting will last (30 minutes is a good rule of thumb). Discuss projects, setbacks, and successes. Feel free to personalize one-on-ones to fit your team culture. The goal of these meetings is help each employee grow and develop. Figure out what works best for you and your team and make one-on-ones a weekly habit. As the CEO, manager, or leader, you have the power to make your company’s culture productive, energetic, and positive. When you develop a friendly work environment, treat everyone with equality, establish team goals, celebrate as a team, and invest in one-on-ones, you set the stage for growth and job satisfaction. You help your employees reach their potential, and your company reaps the benefits. Building a productive team culture takes some work, but the payoff is invaluable.